PMB Series - Power Data Modules provide easy access to electric outlets, USB charging ports, HDMI, VGA, audio, and data connectivity to your desk or conference table. When it comes to looks, PMB Series is long on possibilities. The removable top surface can be customized with an endless range of materials or graphics, while its remaining sides boast a sleek, high-gloss Black or White plastic finish. The possibilities for plugging in are also extensive with a wide range of configurations available for power, data and USB. 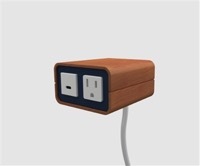 There is even a 2 AMP USB duplex, which is perfect for charging tablets and other USB-friendly electronics. Offered in three mounting options: Monument, Side, and Hole Mount. Each PMB is a custom configuration consisting of power, data and USB connections. You can also customize the color of the top surface, or use a custom graphic, such as your company logo. It is available with a 4 amp USB duplex connection which is ideal for charging two tablets and other USB friendly electronics. UL Listed and available in 15 AMP cord. My PMB Power Modules from VQV on Vimeo. When it comes to looks, PMB Series is long on possibilities. The removable top surface can be customized with an endless range of materials or graphics, while its remaining sides boast a sleek, high-gloss plastic finish. The possibilities for plugging in are also extensive with a wide range of configurations available for power, data and USB. When it comes to looks, PMB Series is long on possibilities. The removable top surface can be customized with an endless range of materials or graphics, while its remaining sides boast a sleek, high-gloss plastic finish. The possibilities for plugging in are also extensive with a wide range of configurations available for power, data and USB. When it comes to looks, PMH Series provides easy access for charging USB devices. When it comes to looks, PMY Series is long on possibilities. The removable top surface can be customized with an endless range of materials or graphics, while its remaining sides boast a sleek, high-gloss plastic finish. The possibilities for plugging in are also extensive with a wide range of configurations available for power, data and USB. When it comes to looks, PMY Series is long on possibilities. The removable top surface can be customized with an endless range of materials or graphics, while its remaining sides boast a sleek, high-gloss plastic finish. The possibilities for plugging in are also extensive with a wide range of configurations available for power, data and USB. When it comes to looks, PMY Series is long on possibilities. The removable top surface can be customized with an endless range of materials or graphics, while its remaining sides boast a sleek, high-gloss plastic finish. The possibilities for plugging in are also extensive with a wide range of configurations available for power, data and USB. PMY packs a fashionable - and functional - punch in any workplace. PMY is a member of the MyModuler family, bringing customizability to a new level. With its removable, customizable top, the creative possibilities for texture or pattern are endless. PMY also features a sophisticated, high-gloss White or Black plastic finish. When it comes to looks, PMY Series is long on possibilities. The removable top surface can be customized with an endless range of materials or graphics, while its remaining sides boast a sleek, high-gloss plastic finish. The possibilities for plugging in are also extensive with a wide range of configurations available for power, data and USB. Now it is easy to add a little spice to your workspace. And we do mean little. Our PM - Salt is a charging dynamo with dual charging USB, 2 amps per port. Available in five great finish options. For functionality - and flavor - you can't beat a dash of Salt. Now it is easy to add a little spice to your workspace. And we do mean little. Our PM - Salt is a charging dynamo with dual charging USB, 2 amps per port. Available in five great finish options. For functionality - and flavor - you can't beat a dash of Salt. Fun, fashionable and little bit funky, Hemisphere is a great way to round out your power and data needs. Its punch of color, sleek, domed profile and smooth surface are just plain cool. The soft touch finish and circular simplex trio further underscores a modern yet playful attitude. Three port options available. With functionality and personality to spare, Hemisphere takes well rounded to a whole new level. Fun, fashionable and little bit funky, Hemisphere is a great way to round out your power and data needs. Its punch of color, sleek, domed profile and smooth surface are just plain cool. The soft touch finish and circular simplex trio further underscores a modern yet playful attitude. Three port options available. With functionality and personality to spare, Hemisphere takes well rounded to a whole new level. With a sleek profile and modest footprint, this little dynamo is ideal in tight spaces. MiniTap's Face Mount, Hidden Mount and Clamp Mount options even make it a natural in upholstered furniture applications, and its metallic and gloss finishes complement any environment. The flexible port design also allows for multiple power and data configurations. With a sleek profile and modest footprint, this little dynamo is ideal in tight spaces. MiniTap's Face Mount, Hidden Mount and Clamp Mount options even make it a natural in upholstered furniture applications, and its metallic and gloss finishes complement any environment. The flexible port design also allows for multiple power and data configurations. Now it is easy to add a little spice to your workspace. And we do mean little. our PM - Pepper is all power with its circular simplex featuring our spill-proof technology. Available in five great finish options. For functionality - and flavor - you can't beat a dash of Pepper. Now it is easy to add a little spice to your workspace. And we do mean little. Our PM - Salt is a charging dynamo with dual charging USB, 2 amps per port. Available in five great finish options. For functionality - and flavor - you can't beat a dash of Salt. Mayline discount office furniture collection includes modular conference tables from 6' to 30' featuring Mahogany and Cherry hardwood surfaces, cable data power management modules, and sturdy bases with high-style design. Sleek and understated, PMDZ's low profile and smooth, easy-to-clean surface doesn't pull attention away from other workplace elements. Dean's powder-coated trim and coordinating faceplate is also offered in a range of fresh neutrals, for just the right amount of design impact. Available in 2, 3, and 5 window units with USB and power, or power simplexes only. Sleek and understated, PMDZ's low profile and smooth, easy-to-clean surface doesn't pull attention away from other workplace elements. Dean's powder-coated trim and coordinating faceplate is also offered in a range of fresh neutrals, for just the right amount of design impact. Available in 2, 3, and 5 window units with USB and power, or power simplexes only. Sleek and understated, PMDZ's low profile and smooth, easy-to-clean surface doesn't pull attention away from other workplace elements. Dean's powder-coated trim and coordinating faceplate is also offered in a range of fresh neutrals, for just the right amount of design impact. Available in 2, 3, and 5 window units with USB and power, or power simplexes only.